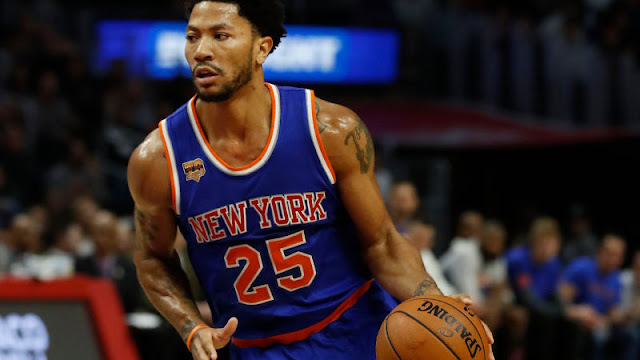 New York Knicks guard Derrick Rose will miss the remainder of the season after tearing the meniscus in his left knee, the team announced Sunday. Those close to Rose expect him to be at full health two months after the surgery, which will be scheduled shortly. Rose, 28, had played in 64 of the Knicks' 76 games this season. Knicks coach Jeff Hornacek praised Rose's contributions despite New York's struggles this season and said he felt bad that Rose couldn't make it to the finish line of the season healthy. "It's tough for Derrick. He has played hard all year," Hornacek said. "He had worked hard last summer with yoga and those kind of things to get his body in great shape. I feel bad for him. "I thought he played well. The explosiveness that you saw years ago, you saw that quite a bit this year. Again, the way the season has gone, to have something like that happen right towards the end, I feel sorry for him." Knicks teammates said they believe Rose will bounce back from the setback. "I feel bad for him. I know how hard he worked throughout the season just to maintain the shape that he was in," said Knicks big man Kristaps Porzingis. "To see that happen to him, right now, at the end of the season, it's tough. I feel he'll come back stronger." "I feel for him a lot," said Courtney Lee. "That's a quick-healing injury. I think, what is it, six, seven weeks? It could have been worse. You can look at it that way. I feel for him. I'm going to shoot out a lot of prayers for him for a speedy recovery." Knicks guard Ron Baker said Rose helped him a lot throughout this season. "It's tough to see a guy like him, who worked hard all year, to get that injury," Baker said. "Hopefully he will be back to 100 percent this offseason. I think he had a pretty good year, from what I've seen. He obviously taught me a lot." Knee injuries have plagued the three-time All-Star and 2010-11 MVP in the past. Rose tore the ACL in his left knee during the 2012 playoffs and missed the entire following season. He then tore the meniscus in his right knee in his first season back from surgery, costing him the final 72 games. Rose had missed the previous two games with what the team described as soreness and swelling. He said Wednesday that he initially felt the discomfort in his knee before the Knicks' win over the Pistons on Monday, in which he played 33 minutes and scored 27 points. Rose said at the time that he didn't believe the injury was anything serious or would need to be surgically repaired. He had expected to return to the court shortly. Rose and his agent, B.J. Armstrong, have both said publicly that Rose, who becomes a free agent this coming offseason, would like to return to New York. The Knicks were upset with Rose over his decision to leave the team without explanation before an early January game against the New Orleans Pelicans because of what he called a "family issue." But prior to the injury, the Knicks hadn't ruled out the possibility of bringing Rose back for next season, according to sources. Rose averaged 18.0 points, 4.4 assists and 3.8 rebounds this season. Knicks president Phil Jackson acquired Rose in a trade with the Bulls that also netted Justin Holiday. The Knicks sent the Bulls center Robin Lopez and guard Jerian Grant in the deal. Jackson hoped that with Rose and free-agent signees Joakim Noah, Brandon Jennings and Courtney Lee on board, the Knicks could compete for a playoff spot. That didn't materialize, as the Knicks entered Sunday's game against the Boston Celtics with a 29-47 record. They will miss the playoffs for the fourth straight season. 0 Response to "Derrick Rose out for season with torn left meniscus"